Number 3 or Lower Mill buillding dated 1847. Right. Number 2 or Middle Mill building dated 1913. Number 1 or Upper Mill built from 1784. (Left). 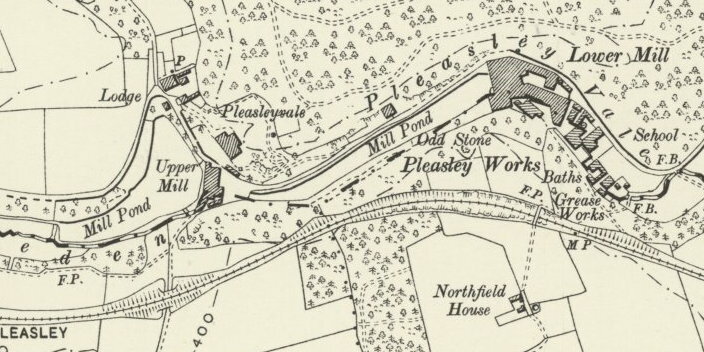 In 1784 a partnership of five men including Henry Hollins purchased 15 acres of land from a Mr. Thornhill to start a cotton spinning business in the area of the old Pleasley Forge and Mill. The forge was previously used to remove chemical impurities from pig iron using a water powered mill. The mill was water powered until 1803 when it was replaced by steam, steam later generated electricity for use on the mill. Gas lighting was used at the mill from 1839 to allow the working of night shifts. Number two mill was designed for woolen and one and three for cotton. The material Viyella was invented here in 1893 by James Robert Sissons. It was the worlds first branded fabric and was made from 55% Merino wool and 45 % cotton. A cheaper product Clydella 81% cotton and Dayella for the manufacture of baby clothes was also produced here. A few notes from the local boards on site from the District of Bolsover.